Why not let us do the cooking for you tonight? Yes! Hire a personal chef to come into your cabin and cook dinner for two. You provide the drinks or wine and leave the rest to us. Dinner for two includes an appetizer and entrée per person and dessert is shared. Sounds great, doesn’t it? There are 2 dinner reservations available, 5:30 PM and 7:30 PM. Pick your reservation time, make your menu selections from the menu below, then viola, dinner’s done! Reservations are made through Can-U-Canoe Guest Services. If you would like to personalize your menu, please contact us, we can work with you and develop your personal menu. Please note that pricing may change. Please allow at least 24-48 hours advance notice. Onion Soup Gratinee; rich onion soup topped with a slice of baguette and topped with gruyere cheese that is toasted until brown and bubbly. Baked brie topped with spiced berries and toasted pecans served with toasted baguette slices. Beef tenderloin medallions with sautéed baby portabella mushrooms finished with a red wine reduction sauce. Served with smashed Yukon gold potatoes and sautéed fresh zucchini medley. Thick bone-in pork chop stuffed with brie and topped with sautéed apples and served with smoked gouda cheese grits and sautéed fresh zucchini medley. Pecan crusted butterflied chicken breast topped with a Dijon cream sauce, served with sautéed broccoli and rice pilaf. A warmed blondie topped with sautéed apples, vanilla bean ice cream and a caramel drizzle. Seasonal variations. Currently we are featuring – Pumpkin-Date and Maple-Date cheesecake. 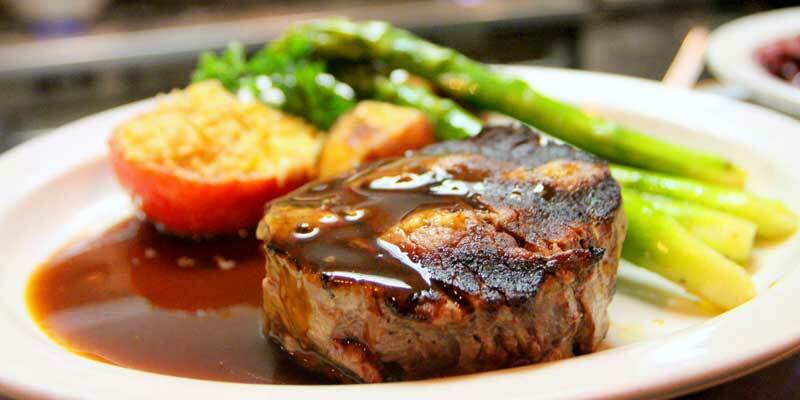 Dinner for 2 people is $120 and includes an appetizer, entrée and shared dessert.